Remember the last time maxi skirts were in? The Olsen twins had just started school at NYU and their dumpster-diving chic was all the rage. I had this awesome brown tiered maxi skirt that I got at Forever 21; I wore it until the elastic waistband gave out. Man, I loved that thing. So I've been waiting patiently for maxi skirts to make a comeback, and I am happy to report that the time is now. Lots of designers showed them for fall, but unlike the last iteration, this season's maxi skirts are of the more refined '70s variety, versus the hippie bohemian ilk. In other words, these maxi skirts are polished and grown-up, and I find their length very refreshing. Not to mention, they're quite practical for fall and winter--unlike minis, they actually keep your legs warm. They also cover a multitude of sins and, when properly fitted, can be incredibly elongating. Polished, flattering, and cozy--can you ask for more? Several decades after launching her namesake line, Donna Karan is creating some of the best work of her career. This fishtail skirt from her resort collection is kind of a wonder to behold. It's satin, which is normally stiff and formal, but she makes it look earthy and organic with a crinkled effect and a slouchy shape. 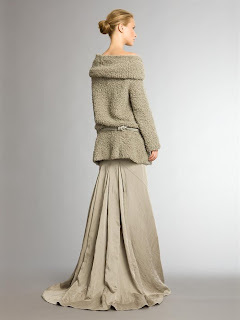 I especially love it paired with the bouclé sweater--it's the definition of ease. 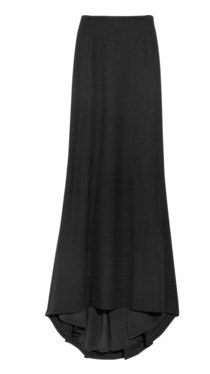 Alexander McQueen's fishtail skirt has a similar shape to the Donna Karan look above, but in black wool crepe, the effect is more Goth and dramatic. It's definitely more of a fall mood, but this skirt can be a building block for so many outfits, and it's refined enough to work for day or night. Plus, it's McQueen, so you know it looks fabulous on. Then again, if you're going to splurge on a maxi skirt, I suggest marching straight over to Rick Owens, who has been showing maxis for years. Owens is a master of this silhouette, and it shows. This skirt is actually from his lower-priced Lilies line (you don't want to know how much a regular-price Rick Owens skirt costs), and it's jersey, which means it's ultra-comfortable. The ruching creates a flattering look through the hips; you can also pull up the skirt and wear it as a strapless dress (hello, two items for the price of one!). Click through the images to see how Net-a-Porter styles it and tell me you wouldn't want to wear this skirt every day. seamed long skirt was one of my favorite items in the collection (she showed it with a fabulous black and white blouse). I like how it plays with volume, being fitted through the hips and softly flaring out in a fluted shape toward the hem. It's glamorous, but versatile enough to wear during the day. I tend to rave about Nicholas K's shows, because they are always full of stuff cool girls want to wear. 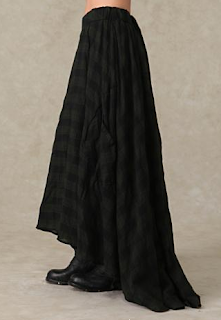 Case in point, this checked maxi skirt, which looks fabulously grungy. The texture is cool, and I love that it's a bit longer in the back--the better to show off your boots in front! silk skirt. The shape is relaxed yet pretty, and the fact that it's silk means you can wear it year-round. Bonus: it's on sale! I'm tempted to get this Forever 21 skirt, since that's where I got my last beloved maxi skirt, shot elastic waistband be damned. Unlike my old one, this has a more streamlined shape, and it's woven, not knit. It's a little no-frills, but for under $20, I think that can be forgiven. I really like this Veronica M skirt--it looks a little summery (or maybe just California girl), but the pattern appeals to me, especially because diagonal stripes are incredibly flattering. This one seems like more of a weekend option, unless you can get away with a more casual look for work. ASOS (which now has a U.S.-based site!) has a ton of maxi skirts in all shapes and sizes, most of which are well under $100. I picked this one, because the contrasting panels are really interesting, and the fit is body-conscious while still being quite flattering. Skirts like this are made for wearing with lots of long, slouchy layers--the perfect wintertime outfit. Long skirt ? yes, it's gorgeous !